Chantal, standing, is closer to realizing her plan to open a sewing boutique because of what she was able to accomplish with the help of Caritas. A big anniversary celebration will be held on 31 October in Kigali in the presence of thousands of Caritas Rwanda staff, representatives from Caritas members from Africa and other parts of the world as well as Lesley-Anne Knight, Secretary General of Caritas Internationalis. “As Caritas Rwanda marks its 50th anniversary, it is a moment to celebrate the commitment and dedication of all its staff, volunteers, communities, parishes and bishops. They are an important part of the Caritas community, part of and at the heart of the mission of the Church,” said Dr. Knight. The first Caritas in Rwanda was founded in response to the humanitarian crisis caused by the 1959 social unrests and quickly expanded throughout the country. Over the years, the organisation faced many challenges, including food crises, war and ethnic conflict. 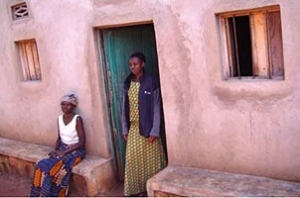 While Caritas Rwanda stayed as long as possible to provide for victims of war in camps at the beginning of the 1990s, the genocide in 1994 forced them to suspend activities and flee to Burundi. Five Caritas staff lost their lives in the tragic events. Caritas Rwanda had always operated on the principle of providing services to all irrelevant of their ethnicity, religion, or politics. Caritas tried to defuse tensions prior to the genocide and played a central role in national reconciliation efforts. “Tragic events like those in Rwanda showed that peacebuilding and reconciliation is an essential element in development,” said Dr. Knight. Caritas Rwanda continues to run healthcare, education, food security and livelihoods programmes all throughout the country. The organisation counts 30 staff at the national office and around 60,000 volunteers.